Everyone loves different things about the holidays, but one of my FAVORITES has always been Christmas cookies. It’s been a tradition in my family for as long as I can remember to make at least a dozen different kinds and then share them with neighbors, friends and at holiday get togethers. We typically have a handful of the same ones we make every year and then I always like to throw in some new ones. This recipe is definitely a keeper for this year. They disappeared almost as fast as I made them. Pre-heat the oven to 350 degrees. 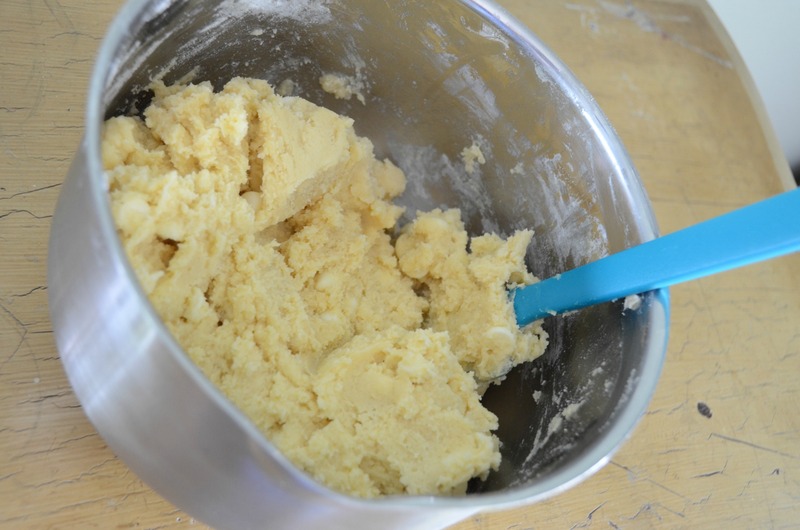 Then start by creaming together the butter and sugar with a hand mixer. Once fully mixed add in the eggs, vanilla and peppermint extract. Now you have a choice of mixing together the dry ingredients in a separate bowl or I’m going to be honest, I always just add them right into the same bowl. I HATE extra dishes to clean and I’ve never had an issue with the end product. So, feel free to be a rebel like me and add in the flour a 1/2 cup at a time and mix. I’ll usually add the cream of tartar, the baking soda and the salt after I’ve mixed in about half the flour and then finish off with the rest of the flour. Once the dough is fully mixed, add in your desired amount of white chocolate chips and stir just until evenly distributed. Next mix together the two decor sugars in a small bowl and line two cookie sheets with parchment paper. Roll the dough with your hands into small balls and then roll in the sugar mixture to coat and place on a cookie sheet. Place the cookies in the pre-heated oven and bake for 8-10 minutes. 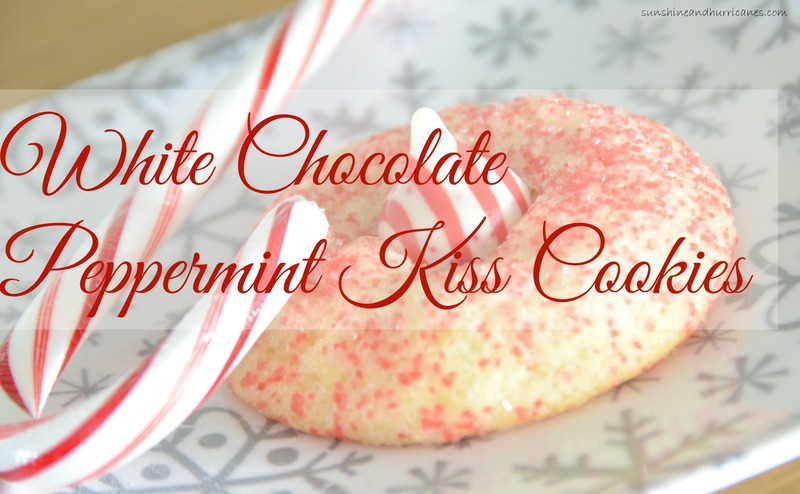 While the cookies are baking unwrap your candy kisses, because you will need them almost immediately after the cookies come out of the oven. 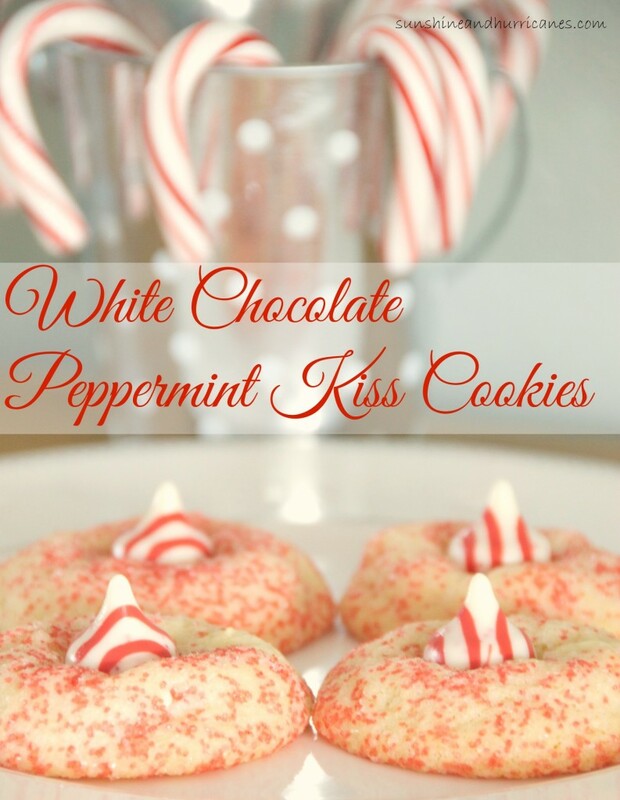 Remove the cookies from the oven when done and then press one kiss into the center of each cookie. Do it carefully and try not to move the kiss afterward, because the chocolate will become soft quite quickly. Allow the cookies to cool a few minutes and then remove them to a rack. You will want to let the cookies sit a few hours for the kisses to harden back up before you place them in a container for storage. Pre-heat the oven to 350 degrees. Then creaming together the butter and sugar with a hand mixer. 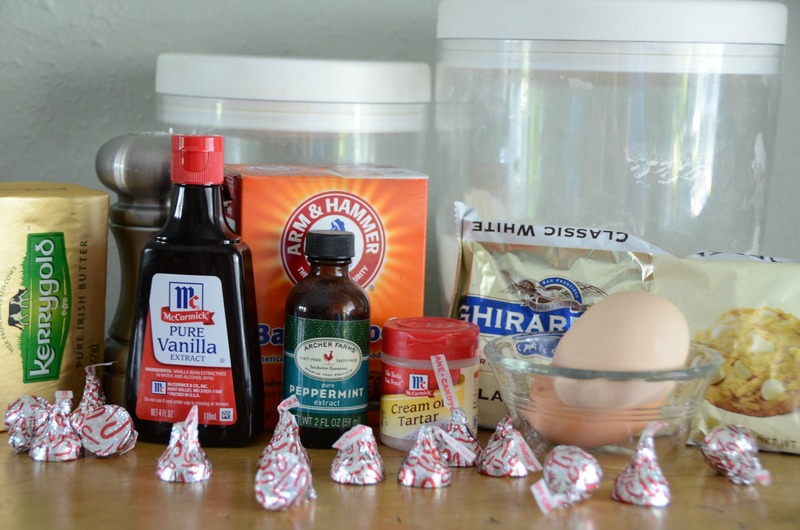 Once full mixed add in the eggs, peppermint extract and the vanilla. Add in the flour a ½ cup at a time and mix. Once you've mixed in about half the flour, add the cream of tartar, the baking soda and the salt then finish off with the rest of the flour. Once the dough is fully mixed, add in your desired amount of white chocolate chips and stir just until evenly distributed. Next mix together the two decor sugars in a small bowl and line two cookie sheets with parchment paper. 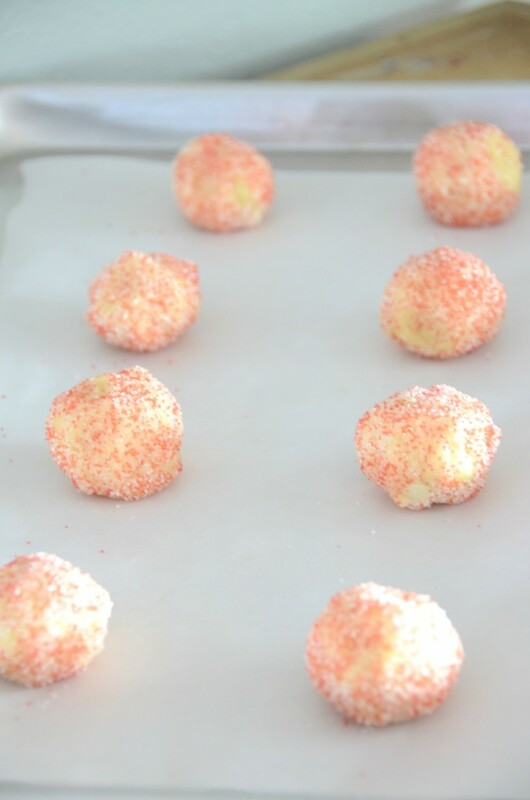 Roll the dough with your hands into small balls and then roll in the sugar mixture to coat and place on a cookie sheet. These cookies look so yummy! 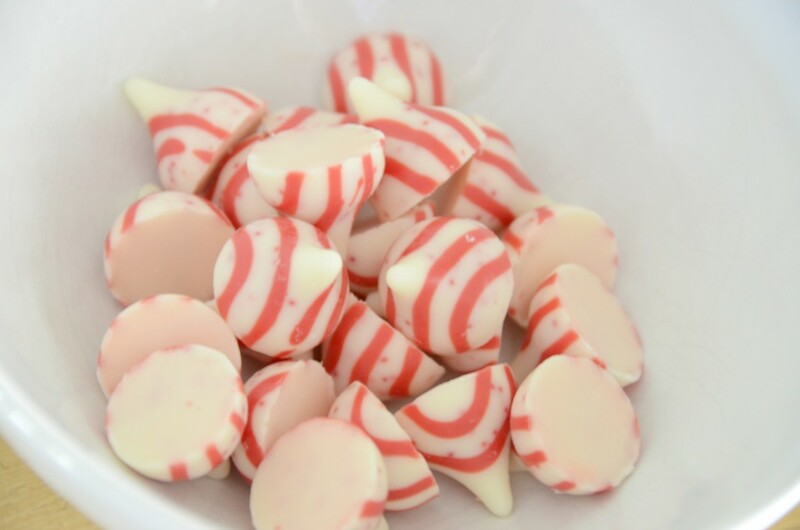 Never had peppermint cookies before.